While Content Marketing is important, it’s how you integrate the content into your overall Marketing tactical plan that is of utmost importance. It’s the “engagement” that fuels all digital communications from compelling websites designed to convert and strategic search engine marketing to social media and email marketing. Most companies don’t have a good handle on how to fully integrate their content marketing across all channels, especially bridging digital marketing with more traditional marketing techniques. Understanding what messages you are sending to which clients and when, which takes into account all aspects of integrating marketing and messaging into the client lifecycle. The complexity of marketing has increased; however, there are many tools and techniques for mapping your client journey to define the most relevant communications and experiences for the various client touch points. This touch points can occur across organic, paid and earned media. Looking for gaps in the communications you are currently utilizing to the ones you could be using will help boost effectiveness and engagement. Part of increasing effectiveness and engagement is developing ways to personalize content. 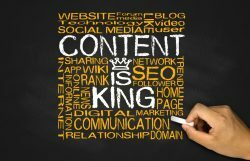 The first step is to develop a Content Marketing Strategy. After than you look at your challenges and possibilities, as well as the tactics to employ, such as automation and technology. Next is understanding your vertical specifics and personalization parameters based on audience definitions and data. Then you finally get to the content creation, curation and promotion. Lastly, how will you measure the impact of your content strategy and what are the success metrics? For more information on developing custom content for your business and the impact it can have to your overall business performance and profitability, give us a call for a consultation.